Being a new mom these days means you have a whole lot of options when it comes to baby ware. 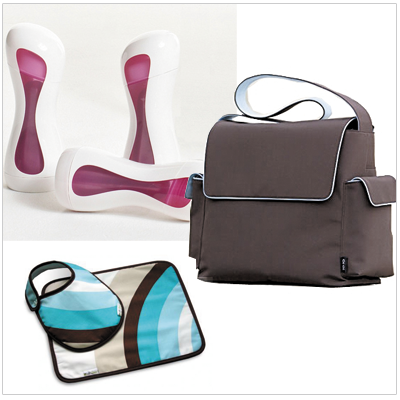 Diaper bags, bibs, even baby bottles have gotten a modern facelift. Check out Karim Rashid's "Iiamo Go" bottle which heats up milk to body temperature using special cartridges. Oioi's diaper bag features clean lines and gender-neutral colors so your better half won't shirk his pack mule duties from time to time. And while this Egg Bib and Burp set isn't exactly revolutionary in terms of form, its playful yet sophisticated palette lets everyone know how discerning your baby's tastes really are when s/he spits up that pea puree. I love the baby bottles. So convenient when you're on-the-go. I wish I had these around when I had my first child! Unisex bag sure saves time and money! The baby bottles look a little space age. I'm not sure I would spend the money on that. BUt the bag looks great and very male-friendly.